A FOUR-YEAR ROADMAP TO YOUR DICKINSON EXPERIENCE. The Dickinson Four is about asking the right questions at the right time. It’s about seeking out the answers rather than waiting for them to be handed to you. It’s about always asking “why” and “why not.” It’s about making the most out of your four years and understanding what’s at stake during each. Your story has many chapters before it's a life story. The Dickinson Four is a four-year roadmap to your Dickinson experience, grounded in the mission of the college, designed to ensure that you are asking these questions with purpose, intensity, depth and support. Each year, a variety of intentionally designed signature programs—in conjunction with Dickinson’s rich offering of over 43 majors, minors and certificate programs and more than 100 student-run clubs and organizations—will foster opportunities to explore your identity, your experiences, your goals and your next steps. 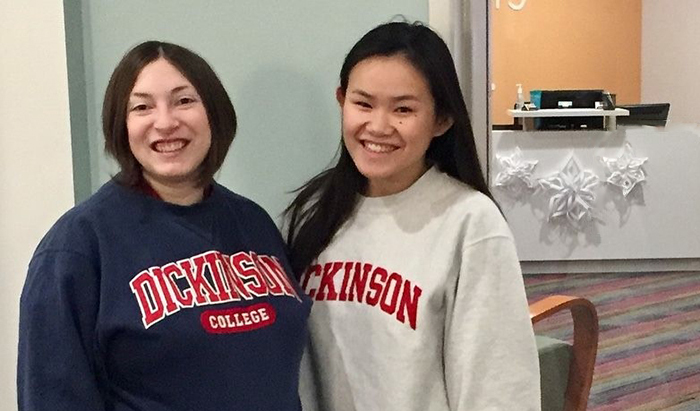 You chose Dickinson because you found your college “fit.” Now that you’re here, we want to welcome you into our campus community. The beginning of your Dickinson experience offers you a chance to deepen your sense of affinity and connection—both inside and outside the classroom. With a bit of initiative, you can make your place here. The discovery process will be different for each student, and it will vary from one area of a student’s life to another. Overall, however, the sophomore experience focuses on making decisions, continuing exploration and balancing plans for the future with experiences in the here-and-now. Whether you’re on campus or away, the junior year is a time to challenge yourself by questioning your assumptions, connecting with others and sharpening your critical thinking skills. When you do so, you will likely find that your ideas and opinions have evolved since you first arrived at the college—including your views on inquiry, inclusion and civic engagement. How will you now deepen your knowledge and broaden your horizons? The senior year offers the chance to put it all together—to make sense of the Dickinson experience and to prepare for what lies ahead. Over the course of the year, you'll work to articulate the value of your education, not only to our campus community but to the wider world. The Dickinson Four was created to help students create a cohesive experience. The Dickinson Four connects Academic Advising, the Career Center, New Student Programs, Student Leadership & Campus Engagement, Residential Life, the Center for Global Study & Engagement, the center for Civic Engagement, the Center for Sustainability Education, the center for Service, Spirituality, and Social Justice, the Women's & Gender Resource Center, the Office of LGBTQ services and the offices of advancement and admissions. Together, we share a commitment to Dickinson’s institutional mission: to provide a useful education rooted in sustained inquiry, inclusive leadership and civic engagement. Dickinson College alumni and parents can help current students jump-start their career development by hosting an externship this winter.